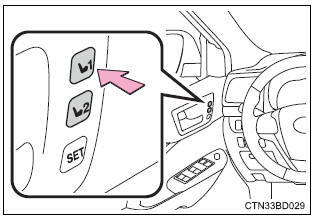 Your preferred driving position (the position of the driver's seat and outside rear view mirrors) can be recorded and recalled by pressing a button. Two different driving positions can be recorded into memory. Adjust the driver's seat and outside rear view mirrors to the desired positions. While pressing the "set" button, or within 3 seconds after the "set" button is pressed, press button "1" or "2" until the buzzer sounds. Check that the shift lever is in p.
Press one of the buttons for the driving position you want to recall until the buzzer sounds. Press button "1" or "2". Operate any of the seat adjustment switches (only cancels seat position recall). 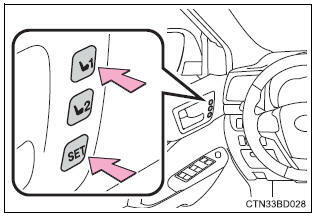 The seat position, with the exception of the portions adjusted by the seat cushion length switch and lumbar support switch, can be recorded. Recorded seat positions can be activated up to 180 seconds after the driver's door is opened and another 60 seconds after it is closed again. If a seat position is already in the furthest possible position and the seat is operated in the same direction, the recorded position may be slightly different when it is recalled.